When i got home this morning the weather was calling for high winds and rain starting about noon so i thought i would go out for a lil while and see if i could rattle something in. I told my wife that i had a feeling that i might have some luck since in was the anniversary of me killing my buck last year. I made a mad dash to get my gear rounded up and my clothes changed. I made it to the woods and was settled into my stand at 8:35am. Well the weather man was wrong and the wind was howling pretty good. I start a rattling sequence as soon as i got in the tree. A short time later i thought i heard a branch break behind me and turned to see a buck standing directly downwind. 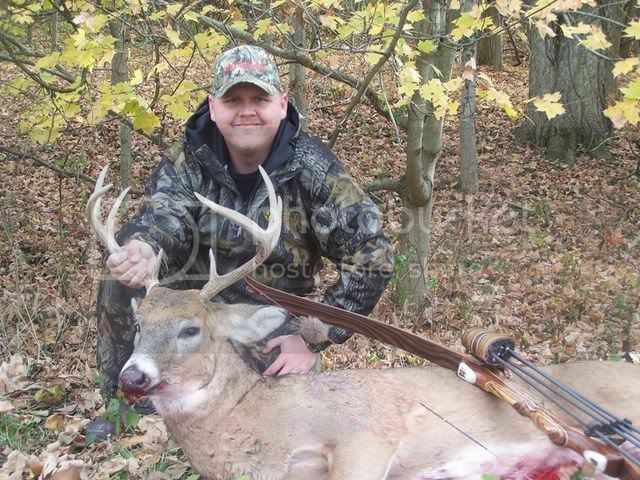 As the buck started to walk behind a tree, I stood and grabbed my bow. I hit the grunt call a couple times and though he would stop and look he would not come any closer. In fact the buck started angling away from me. As he neared a tractor path i prepared to shoot. I bleated to stop him as he stepped into the opening. I quicly judged the distance and set my gap as i came to full draw. At the release i could see that the hit was good and i didn't think he would go far. I gave him about 20 min and got down to inspect the hit. I found blood with no problem and followed it to the bottom of the hill where i found him lying. The result was a 36 yard shot and a 125 yard recovery. Not my biggest, but with the season i have had i am tickled to death to get him. I had hunted everyday of the season except for 6 days and i was starting to get run down. Now i get to sit back and relax for awhile. Way to go Chad. 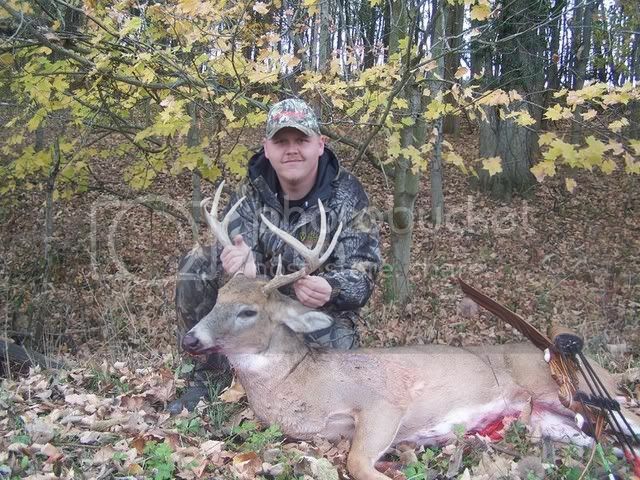 Nice buck and shot. Congrats Chad! Heck of a shot too! I'd love to hear of the equipment you used to take him. Nice bow and quiver too! What a nice buck and a wonderful, centerpunched, clean shot. As my granny used to say "He is grinnin like a cheshire cat!" great job brother. Nice Work Chad. I missed this originally for lack of internet. Way to go again this year. Sounds like an awesome shot!